Explore Venice on a hop-on, hop-off cruise, valid for 48 hours! Explore Venice on a 48-hour hop-on, hop-off tour and enjoy skip-the-line admission to Da Vinci’s museum. Enjoy a Venice cruise and hop on and off the boat to visit attractions of your choice for 48 hours! See attractions like the Piazza San Marco and Ponte dei Sospiri, the beaches of Lido and the island of Murano. Explore the mind of a genius with a visit to the Leonardo Da Vinci Museum. Waste no time in waiting in lines with a skip-the-line admission to the museum and study Da Vinci’s medical works, inventions and artistic accomplishments. Hop-on, hop-off cruise: 9:40am to 3:20pm, every 30 to 60 minutes depending on season. Hop-on, hop-off cruise: Voucher must be exchanged at the City Sightseeing Venice Visitor Center situated inside the train station Santa Lucia in front of platform 14. You can hop on the boat at any of the stops. Leonardo Da Vinci Museum: Before going to the museum the voucher MUST be redeemed at the City Sightseeing Venice Visitor Center . The Museum is located in Campo San Rocco, 3052, next to the Basilica dei Frari. Hop-on, hop-off cruise: You can hop off at any of the stops. Leonardo Da Vinci Museum: Same as the start point. You can hop on the boat at any of the stops to start the cruise. Discover the charms of Venice from the water. 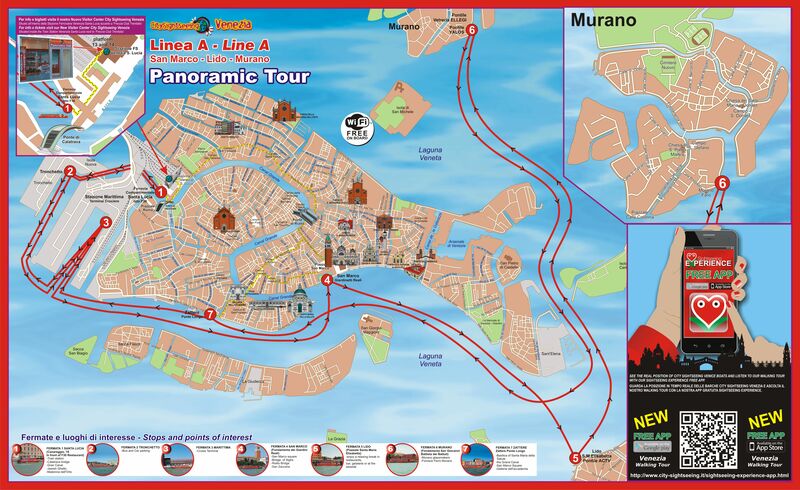 Sit back in the signature red boats of City Sightseeing and explore the Venetian Lagoon. Built on an archipelago of 118 Islands, Venice is intersected by over 150 canals and is connected by 400 bridges and therefore can only be visited on foot or by boat. Hop on and off at any of the stops for 48 hours with the complete freedom to visit the major attractions nearby. Visit the Piazza San Marco and Ponte dei Sospiri, the beaches of Lido and the island of Murano at your own leisurely pace and according to your own preferences. 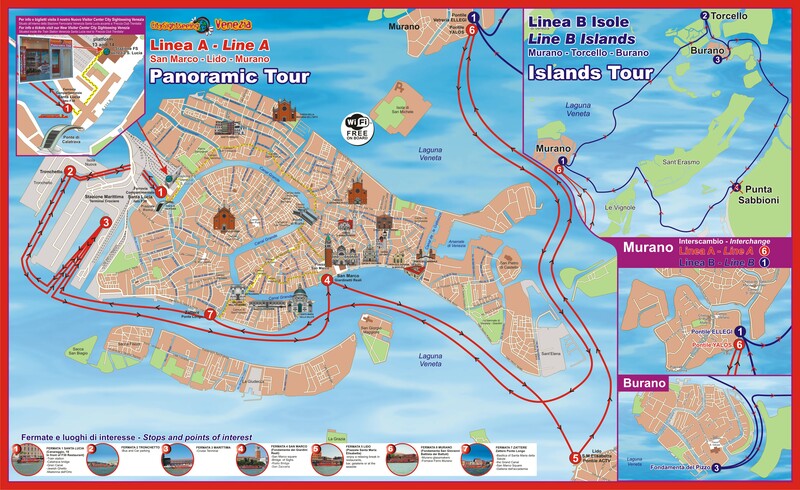 Some of the stops along the Line A and Line B are St. Mark's square, Lido di Venezia, Murano Island, Zattere and Santa Lucia train station, Murano, Burano, Torcello. You can hop off the boat at any of the stops to end the tour. Make your own way to the Leonardo Da Vinci Museum and save time by enjoying a skip-the-line access to the museum. Admire a collection of Leonardo da Vinci's extraordinary inventions at the museum, in the heart of Venice. Explore the mind of a genius through Da Vinci’s most important paintings, interactive machines, multimedia videos, educational laboratories, infographics and his anatomical studies. Study the complex but captivating inventions at a museum themed around the 4 elements: earth, water, fire and air. Discover machines built according to Da Vinci’s original designs, delve into his major studies of human anatomy and see high-resolution backlit replicas of his major paintings. An enriching experience for adults and children alike, there’s much to study, understand and learn at a museum which pays tribute to one of the greatest minds in history. His medical work and artistic accomplishments throw light on the keen and brilliant mind of Da Vinci. Benefit from descriptions in Italian, English, French, German, Spanish and Russian, supplemented by multimedia displays detailing his life and works. After the visit, you can continue to explore Venice on your own. Voucher information: No need to print! You can show your voucher on your smartphone or other device. The validity of your ticket will start when you exchange your voucher. Free admission for children from 0 to 5 years. Download the free app Sightseeing Experience with audio-guide of the city center. Stop 2 of Line A, Tronchetto, is temporarily suspended until further notice. Before visiting the museum remember to exchange your voucher. Your attraction ticket can be used either on the date chosen at the time of booking or the following day. When you exchange your voucher please inform the guide/hostess what day you would like to visit the museum.Line B is functional only in summer. F30 restaurant that was in front of stop n. 1 of line A has been replaced by KFC fast food outlet due to its closure.